Yay, I finally got around to doing a sketch challenge!! Woo hoo. This one is from Taylored Expressions TECC73. I love doing Taylor's sketches, they are always so fun. I finally opened my Bella Rose DSP (pg 134 Idea Book & Catalogue). How nice are these papers - I just love them. I teamed them up with the Friends 24-7 stamp set that I received FREE during this years Convention in Canberra. Below is Taylor's sketch, why not play along. P.S. - today is the start of the pre-order period for demonstrators for the new Spring Mini due out on the 1st August - I have already placed my order and cannot wait for it to arrive. It is jammed packed full of really lovely products. I just know you will love it! Ink: Kiwi Kiss, Riding Hood Red. Paper: Bella Rose DSP, Kiwi Kiss, Riding Hood Red, Whisper White. Accessories: 5/8" Striped Kiwi Kiss Grosgrain Ribbon, Dimensionals. I had a productive night the other night and made 2 birthday cards but I need to make another 2. I also sorted out my DSP into a more orderly fashion so I can find things easily. 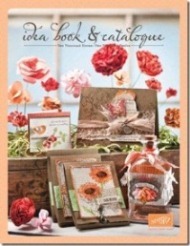 I CASEd this from the Idea Book & Catalogue (a great source of inspiration!) and changed the colours. I stamped the bird in Ruby Red, clear embossed it and cut it out. I used my chocolate chip marker to colour the word 'friends' on the stamp. You can see the background stamp which I stamped in versamark ink. Ink: Ruby Red, Versamark, Chocolate Chip, Old Olive. Paper: Ruby Red, Very Vanilla, Kraft, Sweet Slumber DSP. 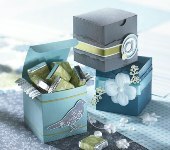 Accessories: 5/8" Chocolate Chip Grosgrain Ribbon, Clear Embossing Powder, Dimensionals.